Step Ahead offers an excellent benefits package including a competitive salary, medical benefits, 401(k), paid holidays, and paid time off. Our school has a strong emphasis on language development, cognitive skills, small and large motor coordination, and development of interaction between children and adults. Children benefit from sequential learning experiences that keep their curiosity and creativity alive. We offer a variety of activities in Art, Dramatic Play, Science, Language, Water Play, Cooking, Music, Phonics, Small and Large Motor Skills, Math and Group Interactions. Our curriculum is developmentally scaled for each age group; we enroll children aged 3 months to 6 years old. We are open year-round, Monday through Friday, from 6:30 AM to 6:00 PM. Please visit our school’s website at stepaheadlearning.com. 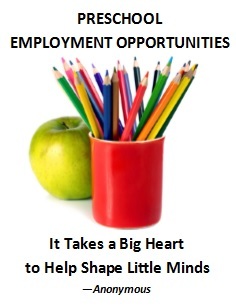 To apply, please send a resume and cover letter to info@stepaheadlearning.com.